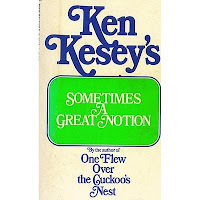 I am surprised to be the first to point out that Huey Lewis gives a wonderful description of Ken Kesey’s Sometimes A Great Notion, while attributing it to One Flew Over The Cuckoo’s Nest. Throughout the 1970s I told anyone who would listen that I considered the story of the Stamper family versus the union (and the river) as THE Great American Novel. I compared his style to Faulkner, with the point of view and narrator constantly shifting. Kesey takes you into the head of each wonderfully conflicted character, as they confound and frustrate one another, the townspeople and the would-be author sent by the union to sort things out.